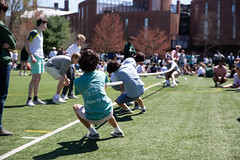 Choate Day is sure to be exciting, with nearly all our teams competing at home against the rival school November 14th. 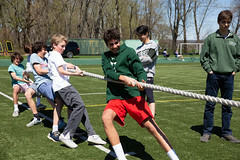 According to Athletic Director Charles Davis, Choate is traditionally stronger in boys’ soccer while our field hockey team tends to dominate. However, with a 2-9-1 record for Choate’s boys’ varsity soccer, this year may prove different, as Deerfield sports a 8-5-1 record. In addition, Deerfield’s varsity football team sits more comfortably at 2-4 compared with Choate’s 0-4-1 record. Choate’s varsity volleyball has had a strong start to their season, racking up an impressive 11-0 record, but our team, at a strong 6-5, is sure to provide tough competition. In addition, Mr. Davis mentioned that field hockey and boys’ cross country are among our strongest teams this year. While both boys’ and girls’ cross country will be away at NMH during the competition, they will still face Choate, as will water polo which is scheduled to compete in the New England Final Four at Exeter. Varsity field hockey, which Mr. Davis notes is “tracking towards the playoffs, depending on a few games between now and Choate Day,” has had another strong season (7-4-1) and hopes for a win against its 4-6 Choate counterparts. At the sub-varsity level, jv field hockey has suffered only one loss to their nine wins, rendering them another team to watch for. 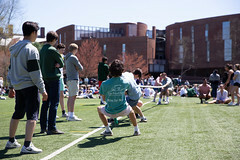 However, Choate Day is an opportunity for every team to attempt a win. He also stressed the importance of not only playing for the team, but of supporting others. Some such Deerfield sub-varsity sports to look out for are girls’ and boys’ jv soccer (7-1 and 8-2, respectively), boys’ junior A soccer (5-1-2), and jv football (6-2). 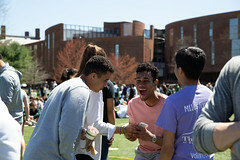 In addition to current students and faculty, Mr. Davis is excited to see last year’s senior class, which he said included some of his greatest students, show their support for our teams. It is traditional for them to attend the pep rally and bonfire the night before the big event, an exciting way to kick off the weekend.